JOIN LEGAL MOMENTUM’S SOCIAL JUSTICE CAMPAIGN this Domestic Violence Awareness Month to ensure that victims of domestic violence, sexual assault, dating violence, and stalking are safe at work. A 2009 study estimated that 51% of stalking victims were stalked on work premises at least once. In a 2012 Vermont study of batterers enrolled in batterer intervention programs, 35% of respondents indicated that they had contacted their victims to abuse them during the workday and had used office resources (work phones, computers, etc.) for that purpose. Nearly 33% of women killed in their workplaces between 2003-2008 were killed by an intimate partner. 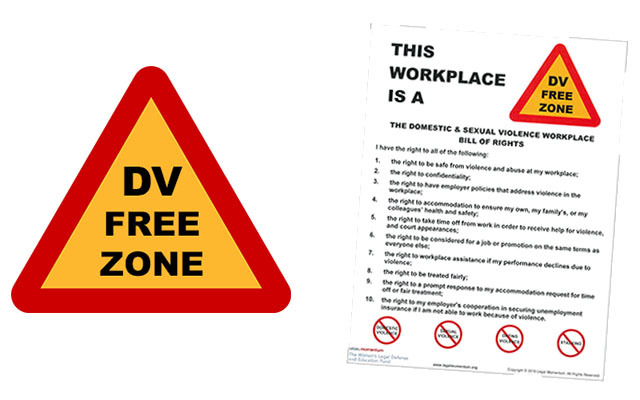 Take a “selfie” with the “This Workplace Is a DV Free Zone” Bill of Rights and post it on Facebook, Twitter, and other social media channels using the hashtag #DVFreeZone. Legal Momentum’s “This Workplace Is a DV-Free Zone” Bill of Rights lists 10 basic principles that all employers should follow to make workplaces safe and accommodating to victims of domestic violence, sexual assault, dating violence and stalking. EACH PERSON WHO TAKES THE CHALLENGE SHOULD CHALLENGE 10 OTHER PEOPLE TO TAKE THE “THIS WORKPLACE IS A DV-FREE ZONE” CHALLENGE. To truly make all workplaces DV-Free zones, everyone who posts selfies should ask their employers to post the “This Workplace Is a DV Free Zone” Bill of Rights prominently in workplaces. (This includes offices, schools, mini-marts, day care centers, cafes, and anywhere that employs people.) If your employers do not already have a domestic violence accommodation policy (and 65% don’t), ask them to adopt Legal Momentum’s Model Domestic Violence Policy. The Model Policy is streamlined, easily understandable, and easy to implement. The policy protects victims, their co-workers, and employers. Our talking points will facilitate implementing our Model Policy.